The Wild Prairie Children of Sedgwick County are built Sturdy and Strong and here’s their chance to show what they’ve got! 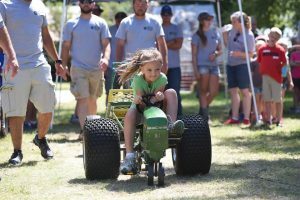 The annual Pedal Pull,sponsored by the Sedgwick County Rural Electric Cooperative, gives kids, ages 4 to12 the chance to pedal tuff for prizes and a chance to compete in the event at the Kansas State Fair in Hutchinson. Registration starts at 9:00 am on Saturday morning in the open air arena and competition will start at 10:00 a.m. There’s no entry fee.